PHUKET: Chinese shrines in Phuket have been stocking up with mountains of food in preparation for the annual Vegetarian Festival which starts on Sunday (October 14), in order to make sure no one goes hungry. Hocxsiew Sanjan, Vice President of the Jui Tui Shrine in Phuket Town, said the shrine has ordered in 400 kilos of Chinese snow peas, two tonnes of Chinese noodles, 620 kilos of bok choi, a tonne of tofu and 10,000 sacks of rice for the Vegetarian Festival. 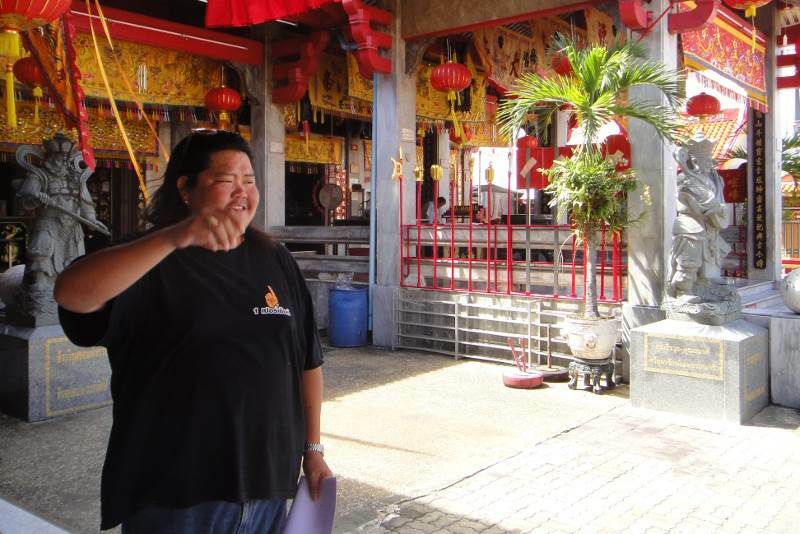 Hocxsiew Sanjan, Vice President of the Jui Tui Shrine in Phuket Town, said the shrine has ordered in 400 kilos of Chinese snow peas, two tonnes of Chinese noodles, 620 kilos of bok choi, a tonne of tofu and 10,000 sacks of rice. The numbers do not take into consideration food stalls located outside the shrine – it is all for the shrine’s 125 volunteer cooks who will supply food to worshippers during the 10 days of the festival. Mr Hocxsiew added that he has asked a Chinese priest to ensure that all the stalls around the shrine prepare “truly 100-per-cent vegan meals” – no eggs or dairy products. The vegetarian festival, he told The Phuket News, “allows the body to recuperate from all the toxins we put into it. Meanwhile, hotels across the island are reporting occupancy rates averaging 85 to 90 per cent, mostly thanks to the tourists coming in from China, Malaysia and Singapore for the festival. The TAT says that the majority of these are people of Hokkien descent. Corporations are also getting on the vegetarian bandwagon. Tesco-Lotus donated B500,000 in support of the Vegetarian Festival, sending out a convoy of food from Phuket to shrines on the island and also in Songkhla, Satun and Phang Nga, where vegetarian festivals are also held. Property developer Sansiri is arranging a “J-Food Festival” event in Bangkok, employing Nok Air to fly genuine traditional Phuket vegetarian food to the capital specially for the event. 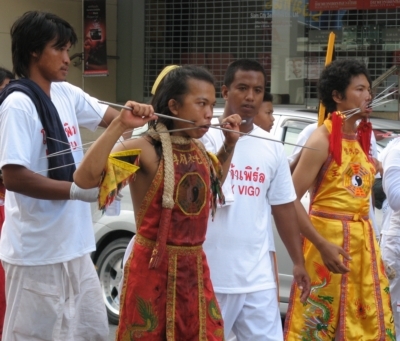 For a full schedule of the Phuket Vegetarian Festival click here. I love it but I can't be there for it this year. How come they don't bleed to death?